$11.6 million plan hopes to turn abandoned houses over to stable homeowners. But there’s another, more optimistic message tacked up on the building. “Your next home! For sale by broker appointment only,” and gives the Department of City Development’s phone number, as well as the address for DCD’s website. The foreclosure crisis, as city officials refer to it, has hit Milwaukee hard, and Mayor Tom Barrett has called it his biggest challenge since taking office in 2004. During his recent budget address to the Common Council, Barrett said the abandoned foreclosed buildings are magnets of criminal activity that are straining city resources, sinking property values and devastating neighborhoods. In his 2014 budget, which awaits Common Council approval, Barrett proposes spending $11.6 million on a Strong Neighborhood Investment Plan that aims to combat the foreclosures in the next three years. That amount is a $7.6 million increase from last year’s budget. The money would come from the general fund and a new tax levy. Harambee, on the North Side, is one of the neighborhoods hardest hit by foreclosures. “People don’t come to us and say ‘I want to buy a home in Harambee,’ ” said Carl Quindel, executive director of ACTS Housing. But Quindel suggests that potential homeowners seize the opportunity to buy affordable housing in the neighborhood. ACTS sold 108 foreclosed homes throughout Milwaukee last year, 39 of which were owned by the city, and a handful of those houses sold for less than $5,000. “This is an opportunity for us as a community to say what’s going to happen to all these houses. The city’s never going to own this many houses again, and it would be a missed opportunity if we don’t look at how we can revitalize neighborhoods,” Quindel said. In addition to affordable housing, Quindel said one of Harmabee’s strengths is the number of homeowners who have been living in the neighborhood for generations. But even they seem to be victims of the housing crisis. Harambee’s longtime residents now own houses that are worth far less than what they owe, said Leif Otteson, community development organizer at Harambee Great Neighborhood Initiative. This deters their ability to maintain and improve their properties, which compounds the effects of foreclosures. In 2002, the median price for single-family homes sold in the Harambee area was $25,000, according to data on the Multiple Listing Service. By 2006 the median price rose to $72,000. A March 2013 assessment puts the median price for single-family homes in Harambee at $31,900. Harambee’s duplexes follow the same trend. 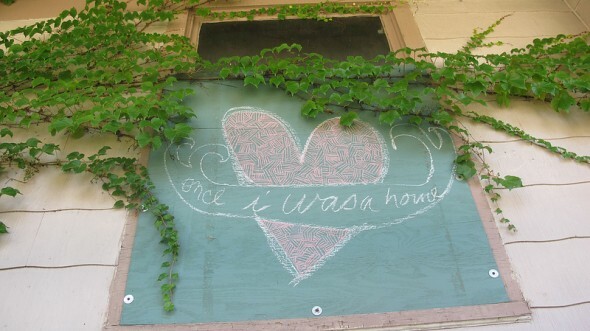 To encourage redevelopment in the Bronzeville district, located at the southernmost end of Harambee, Otteson is working with the city to offer financial incentives such as the Bronzeville New Homes Initiative, which allows homebuyers to purchase a vacant lot for $1 to build a house. Chris Grandt, director of neighborhood development at Riverworks Development Corporation, helps connect community residents with money for rehab and improvement projects through its partnership with the city’s Targeted Investment Neighborhood program. Grandt said the city is in a precarious situation trying to deal with so many neighborhoods experiencing problems. “My experience dealing with the Department of City Development is that they have done a great job supporting Harambee through programs like TIN, where more than $600,000 has been invested in home rehab products since 2009,” Grandt said. 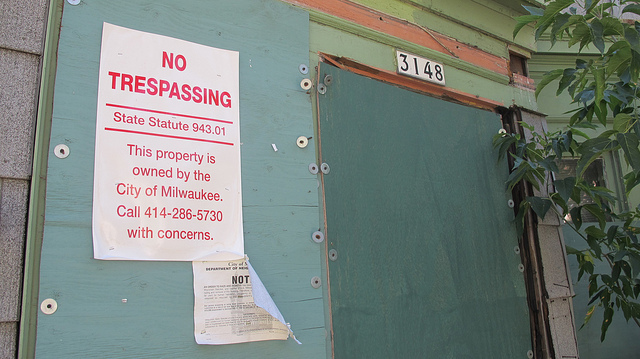 The City of Milwaukee is now the reluctant landlord holding titles to approximately 1,072 tax-foreclosed properties. Officials expect that number to rise to about 1,300 by the end of the year. Data shows the city-owned foreclosures are concentrated on Milwaukee’s North Side. Since the housing bubble burst in 2008, tax foreclosures have gone up rapidly. Barrett said the city now owns 13 times the number of foreclosed properties as it did before the financial meltdown. Vacant buildings attract crime. More than 427 major crimes have occurred at abandoned buildings across the city from January to mid-August of this year, including at least 307 burglaries, 73 fires, 21 aggravated assaults, seven sexual assaults and four robberies, according to Milwaukee Police Department spokesman Mark Stanmeyer. “We’ve decided we can’t wait any longer,” Barrett said at an event before his budget address. “What we’ve been able to do up to this point has been to utilize the federal dollars through the Neighborhood Stabilization Program to help us with rehabilitation.” However, the program has ended. According to the mayor, his plan would help preserve the city’s housing stock and stabilize neighborhoods through a comprehensive approach: prevention, mitigation, revitalization and renewal. The city would work to avoid future tax foreclosures whenever possible by securing properties at an earlier stage, working with owners and inspecting properties to reduce deterioration. Other strategies would be largely determined by the integrity of the foreclosed buildings. They include: rehabilitating properties for resale, scattered-site rental housing or a rent-to-own program; shifting staff resources to market and manage the properties; collaborating with community-based organizations and banks; beautifying vacant land; and significantly reducing the backlog of structures that are on the must-raze list. “Our goals are ambitious and our results will be measurable. Our benchmarks include 300 blighted or unsafe homes demolished and a goal of 350 home sales,” Barrett said during his budget address. Todd Weiler, spokesman for DNS, said the city budgeted about $1 million per year for demolishing properties before 2008. If the mayor’s budget goes through, the city will spend $5 million next year. Properties that pose the biggest structural threat or are associated with criminal activity will be demolished first, he said. Gov. Scott Walker recently pledged $2 million of state money to help the city eliminate blighted properties. The aid stipulates that the city can use no more than $10,000 per property for demolition; city officials say it costs about $15,000 to demolish a single-family home. The mayor’s Strong Neighborhoods initiative calls for a multifaceted response from numerous city departments, with the departments of City Development, Neighborhood Services and Public Works playing key roles. Their responsibilities range from performing inspections and monitoring building codes to cutting lawns. Barrett’s budget proposes creating a “foreclosure czar” to promote intergovernmental cooperation and efficiency. “It’s a complicated problem with many aspects and nuances to it. The mayor’s vision is to have a knowledgeable person help direct administrative resources…so that we are maximizing our response and addressing the problem in the greatest way possible,” said Barrett spokesman Jeff Fleming.